Good news! A second dog is fostered! It's Sophie...and she is one happy hound dog! ABOUT SOPHIE: I am a Female, 6 yr old Lemon Walker Hound, 35 lbs. I live in a foster home now...but I still hope to get adopted. Help us help them by cross posting this information far and wide. 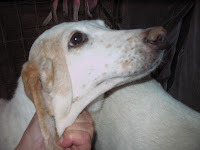 Several of these dogs require medical attention as soon as possible in order to be ready for immediate placement. In addition, we have the ongoing cost of boarding while they wait for their next home. Tell your friends, families, and coworkers about The Plight of the Sussex Hounds. Our goal is to see each and everyone of these sweet doggies fostered or adopted before the end of the month ...AND WE CAN'T DO IT WITHOUT YOUR HELP. Their future rests in your hands.